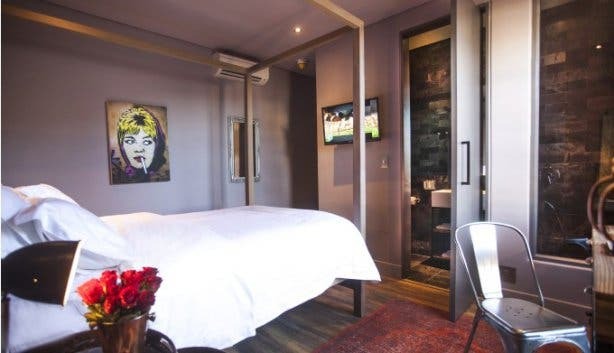 romantic boutique hotel in vibey De Waterkant. Ever felt instantly excited for adventure and discovery in a city when you find that one place where you can just be yourself and explore? You know, when you arrive and there’s this buzz around the building, with people gathering around the special little food and coffee shops nearby. The exciting place, where you walk in and there’s the warmth of the fireplace (in winter) and the smell of easy-comfort food from the kitchen, a black baby grand piano and cosy atmosphere. And you’re supposed to just take a load off and relax first (you’ve probably travelled a while to get here), someone’ll help you sort your parking just now. 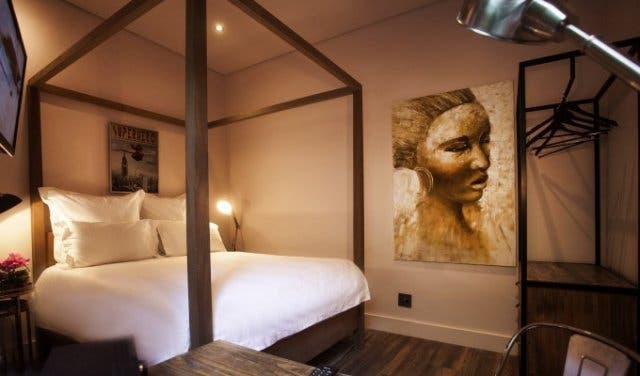 This is The Grey Hotel, a boutique-stay discovery inside a 19th-century Victorian building on Napier Street in Cape Town’s vibey De Waterkant. And there’s something special to uncover in every little nook and corner around here. If your room feels cosy, quaint and unique, that’s because comfort is the big focus here. Not to mention that everything inside your room was custom-created and fitted for the space. 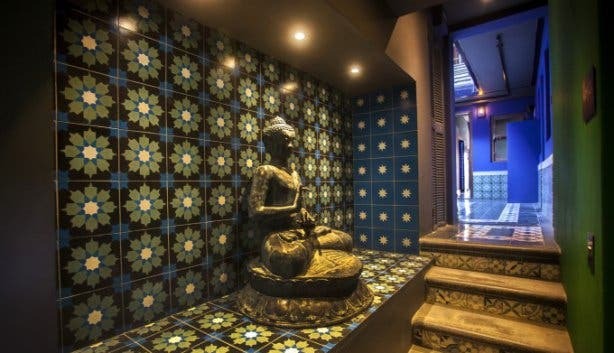 From the art to the colours, furnishings and even the wooden four-post bed (made from hand-drawn designs), everything was either built by hand by local artisans or customised to fit the space. Help yourself to the minibar, it’s stocked with refreshing drinks and the first round is complimentary. After that, stock it with whatever you like. Don’t stress about drinking water, either. 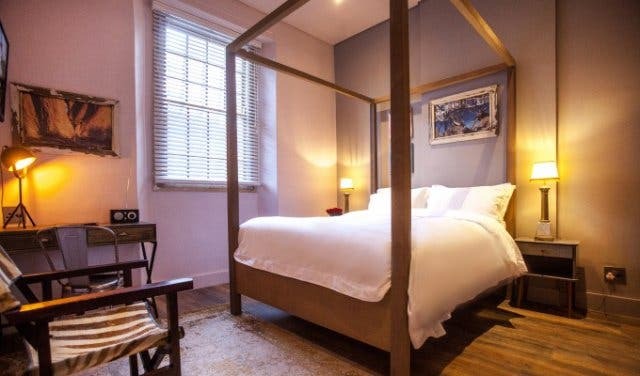 There’ll be a fresh, complimentary bottle of mineral water in your room every day, as well as organic and locally made Charlotte Rhys soaps, shampoos and creams in the ensuite bathroom. And you’re encouraged to do your worst and sleep late, too. Breakfast, including everything from omelettes to fruit salad and homemade bread, is served from 7am to 12pm at The Piano Bar downstairs. Tip: Check out the incredible mattresses and specially selected linen on the custom four-post bed – yeah, you’re encouraged to enjoy those and sleep in if you feel like it. Speaking of The Piano Bar, did we mention that The Grey Hotel is run by the same people as this popular live music and good food spot? 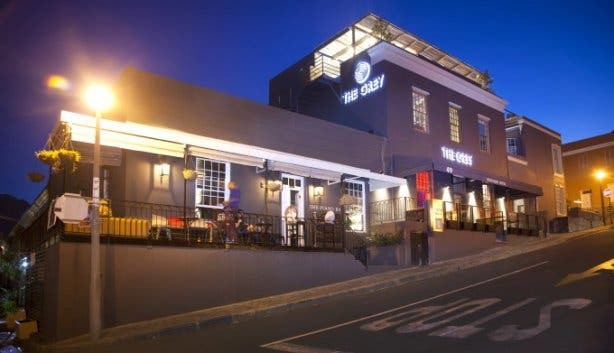 It’s the same building and residents have easy access from any of the 13 rooms to the – as well as to the ‘SkyBar’ with its full views of Table Mountain for enjoying sundowner cocktails on sunny days. Back to The Piano Bar where the updated menu now features delicious-but-easy meal options, from 2-in-1 burger sliders to deluxe tapas platters and beef fillets, for a uniquely South African meat experience. And, of course, it’s all of this while you’re chilling to live music next to a cosy fireplace. Also in The Grey building is contemporary tapas-style Japanese cuisine at the ever-popular SHIO or Asian street food from the Lucky Bao, which makes it the perfect The Grey experience. 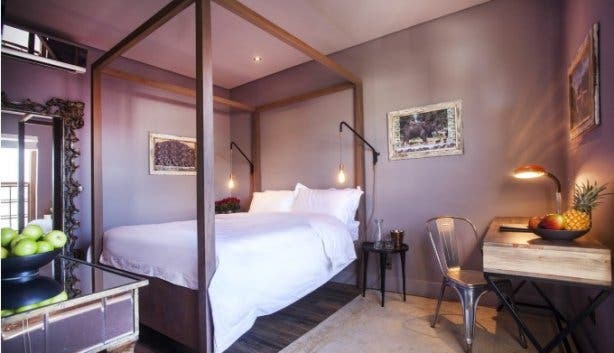 The Grey Hotel will gladly help you make reservations, organise car rental or book your tickets, tours and activities – anything you want to discover and explore in Cape Town. The Grey will give you the local’s insight on what to see, do and explore in the city. Tip: Residents pay a special discounted rate to work out at the Zone Fitness (just two minutes’ walk away) and there’s also a handy overnight laundry service. Centrally located, The Grey Hotel literally puts you in the heart of Cape Town, from where there’s so much to experience and explore. Tick off a few ultimate bucket list items or experience some of the more unique Cape Town adventures. The Grey Hotel recommends taking a boat cruise when visiting the famous V&A Waterfront. Or hike Lion’s Head or Signal Hill – and why not arrange a paragliding adventure while you’re there? Or, explore De Waterkant or the nearby Bo-Kaap with its eclectic people, herbs and spices, and rich history. 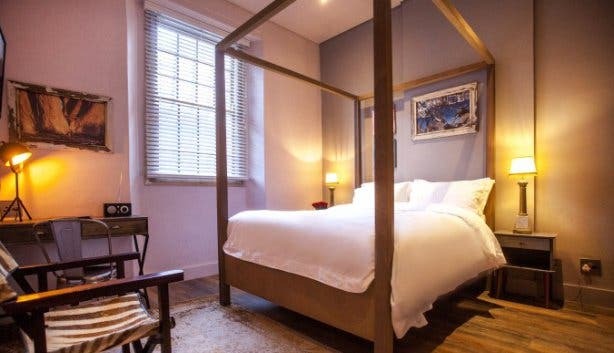 And, of course, you’ll be coming home to the cosy comfort of your room and the option of a romantic dinner at The Piano Bar, with the option of going it as late as you like to do it all over again tomorrow. 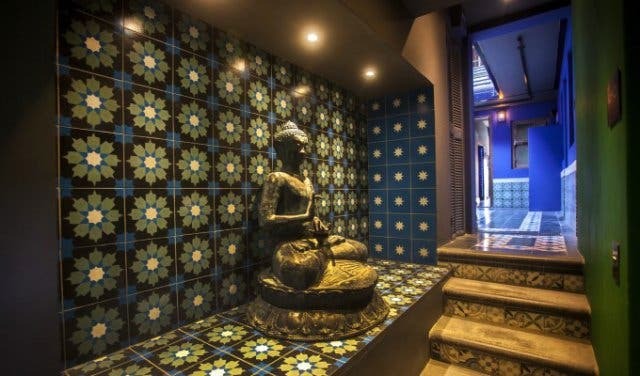 Love a unique hotel stay? 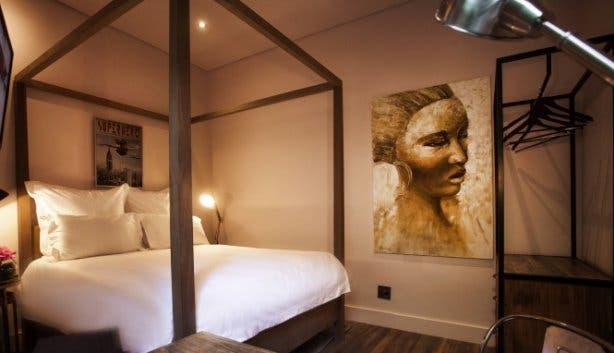 Check out this selection of cool and unusual places to stay around Cape Town, see our choice selection of winter weekend getaway spots or indulge in our selection of all the coolest accommodation specials. Like being swept away by that special someone in a special place? Try these super-special romantic getaways. Feel most at home with good vibes and great views? Experience these unique rooftop bars around the city.